Deb Skilton of Renton, WA, says she was moping around the house after the death of her cat, Oreo, from cancer, and after a week of being cat-less, she started looking on Petfinder. She “fell in love with two gorgeous tuxedo boys, Pounder and Gunther” listed by Regional Animal Services of King County in Kent, WA. She had always wanted two cats but was never sure how Oreo would get along with another cat – but now, if all went well, she could realize her dream. 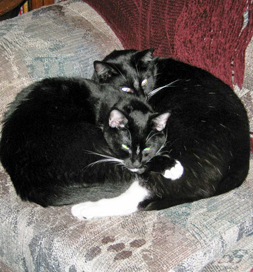 Pounder and Gunther are two lucky cats who were adopted together. “I went down to the shelter and told the volunteers that I wanted to meet Pounder, a very big boy that definitely lived up to his name,” she says. After getting acquainted with him for a bit, she handed the cat back over and asked to meet Gunther. The shelter worker who had brought him out looked a bit forlorn as she hoisted the big cat from Deb. Perhaps such a hefty cat was having a hard time getting adopted. She disappeared to take him back to his cage and soon reappeared with Gunther, who was “a young skinny boy all full of energy, and we hit it off,” Deb says. They got acquainted for a little while, and then Deb came out of the greeting room. She could see the hope on the worker’s face as she asked if Deb wanted to take one of the cats home. Deb asked, “Can I have them both?” The look of hope on the worker’s face transformed to joy. Working at a shelter can be stressful as the workers and volunteers see pets missing out on being adopted, but then sometimes someone like Deb comes along who makes the day very special. Deb made the cats’ day special, too, as they both moved to their forever home together.